18 July, 2017 Geneva, Switzerland– The Animals and Plants Committees of the Convention on International Trade in Endangered Species of Wild Fauna and Flora (CITES) will gather from today for their 29th and 23th meetings respectively. This year will see the largest number ever of registered participants for the Committees, with some 300 attendees for the Animals Committee and 170 for the Plants Committee. This is a significant increase from previous meetings and reflects a trend seen over the past six years of ever increasing participation in CITES meetings. “Last year’s CoP17 in Johannesburg was CITES largest CoP and it was hailed as a game changer. It is wonderful to see that the same level of enthusiasm is flowing through to the work of the Animals and Plants Committees, which play a critical role in helping to implement many of the significant outcomes of CoP17” said John E. Scanlon, CITES Secretary General. The Animals and Plants Committees provide technical support, based on sound science, to support well informed decision-making about the sustainable management and conservation of CITES listed species. Members of the Committees comprise experts from Africa, Asia, Europe, North America, Central and South America and the Caribbean, and Oceania. This year also sees the appointment of new Chairs to both the Animals Committee and Plants Committee, with Mathias Loertscher of Switzerland and Adrianne Sinclair of Canada, respectively, as well as 9 new members across both Committees. The ten day of meetings, including a joint session of both Committees, will discuss sustainable wildlife management and conservation of awide array of fauna and flora. The Animals Committee agenda will evaluate trade in animals claimed to be 'ranched' or 'captive bred'; address African lions, leopards, cheetahs and African wild dogs in a joint CITES-CMS African Carnivores Initiative; and assess the sustainability and traceability of trade in snakes. Given the growing role of CITES in the management of aquatic resources, it will also address trade in sharks and rays, eels, precious corals, sturgeons, queen conch and bangai cardinal fish, which will all be discussed in detail. The Plants Committee agenda is focused on timber and tree species. 300+ tree species were added to the CITES Appendix II at CoP17 and the implementation of CITES for trade in these species and their multiple derivatives (ranging from precious timber, logs and sawn wood to guitars and other musical instruments) can result in some practical and technical problems, solutions to which will be discussed at PC23. Experts will also discuss orchids and their suspected undocumented trade, and trade in the highly valuable African cherry, East African sandalwood and agarwood. 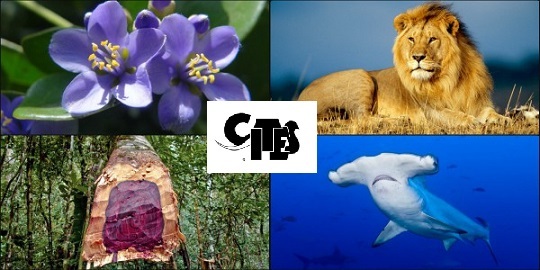 The joint session of the Animals and Plants Committees will reflect on long term directions for CITES, as well as addressing capacity building and identification materials, and guidance for making non-detriment findings. The results and recommendations of the Animals and Plants Committees will be conveyed to the Parties, the Standing Committee (of which the 69th meeting is held later in 2017), and the next meeting of the Conference of the Parties, CoP18, due to be held in 2019 in Colombo, Sri Lanka. The Animals Committee is meeting in Geneva for the first time in five years and the Plants Committee for the first time in six years. During that time, meetings of one or both Committees have been generously hosted by Ireland, Mexico, Georgia and Israel. For more information on the Animals and Plants Committee, please see our information kit.